is there anyway to get the theme manager that comes with windows me to remember to load the theme i choose?it will remember the icons/cusors/wall ect... and even the sysmetrics of the lameskin but will not load the lameskin bitmaps and just reverts back to classic with the sysmetrics of the lameskin. if there is no way for this maybe someone could make one or fix the one from microsoft to work. it would be nice to be able to load a complete theme without having to reapply the skin for each. thanks for your time and hopfully a reply to this. I suggest removing LameSkin, and then installing Revolutions Pack 9.
it also does not work with Revolutions Pack 9,it does the same thing. so if anyone has any ideas please post. I have no clue (and I am a computer layman), but just to be sure: did you try to save the scheme by rightclicking on desktop + properties + appearance + save (giving the scheme a name and then save) ? 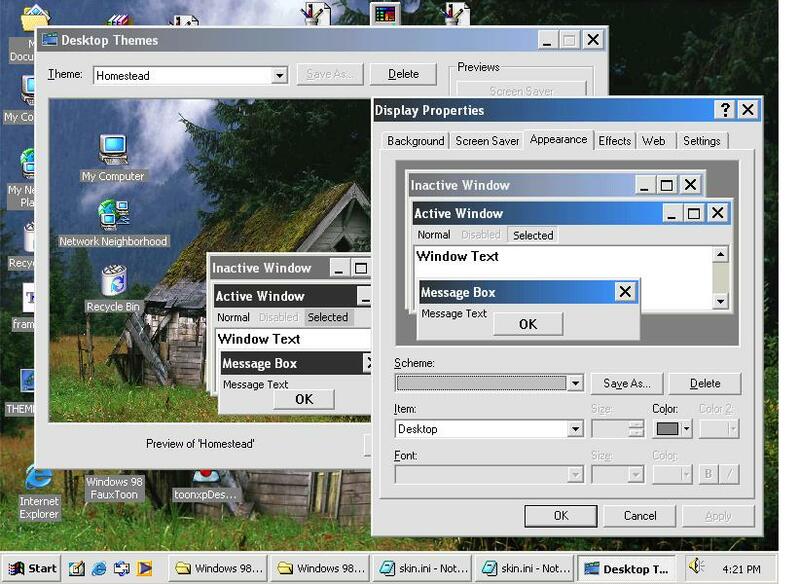 there is no tab for saving a theme in windows 98/me like there is in xp. here is a pic with the theme i saved applied and the desktop properties and theme manager open so maybe you can see what i mean. i get nothing but classic colors and there not even the same,the colors in the theme manager are correct and the system properties are not. Just to try: what is happening if you click on "Save as" (on your screen(shot)) and in the box that will appear you tape "Homestead" and than "ok" and then you restart your computer ? Ok now I understand what you mean - the only thing I know for that is "Desktop architect" ! But heavy on ressources ! if anyone knows anything on how to fix this it would be great. 98 or me should be the same as the theme manager is the same pretty much in both. The theme manager that you see in win98/Me is only the selection part of the complete package. If you haven't installed it already, you need to install the "Win98/ME Plus" package. Once installed that will allow you to create and save your own themes and styles. Otherwise it just allows you to select themes that you have installed - ie created by others (or direct from Micro$soft), downloaded & installed on your system. In windows ME they only included part of the program... so grab the Win98/Me Plus package and it should solve your problems. thanks but i tried it and it does not work. still looking for a solution tho. That's very strange. Did you just re-install the Plus pack from the ME installation CD?? or do you have the Plus Pack 98?